My life revolves around public lands; lands that exist because, long before I was even a thought, people worked to set aside areas where humans would not be the main event. Places where humans would not leave lasting scars. Land where we are not permanent dwellers. Land where we can touch our own mortality. Land where we can experience ourselves as part of something greater, something bigger and grander than we can almost imagine. Land where we can experience ourselves as just another cog in the wheel of life; no more and no less important than the wolves, bears, elk, bison, eagles or even beetles. Wildness puts us in our place, as Barbara Kingsolver wrote. Living in a city, surrounded by human structures, it is too easy to forget that we are part of nature, governed by the same rules. Wildness teaches us who is really in charge, and it is not us. 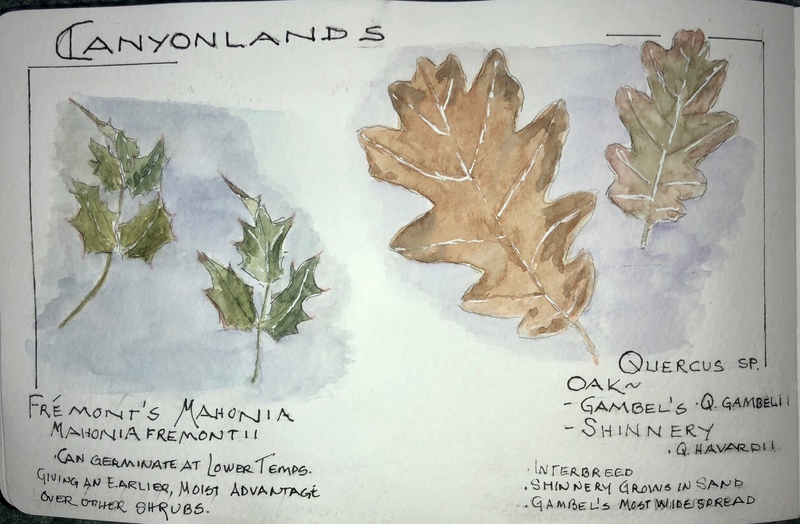 Because I am less distracted by daily home chores, I journal most often when I camp. I appreciate new sights and experiences, and live closer to nature. 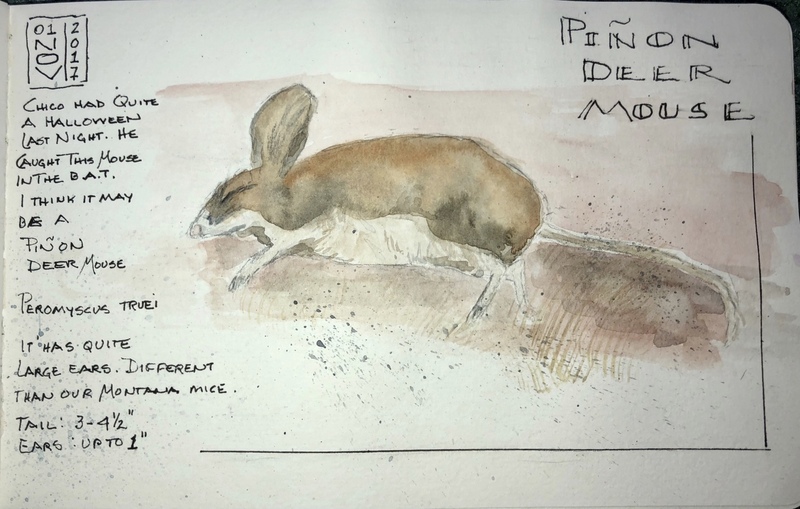 The acts of writing to describe the natural world or sketching a view, flower or animal, put me in my place. I become fully immersed in my here and now. I observe more closely, losing myself in my surroundings. We are home now after a month of October travels in Colorado and Utah. I sit in front of the fire and page through my journal. And I remember. 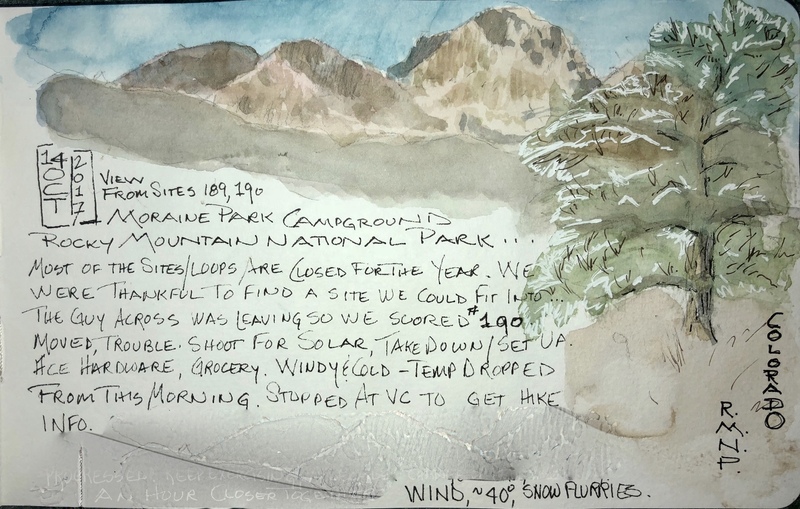 I remember throwing on hat, mittens and my warmest puffy down jacket, stepping outside, grabbing my chair to sit and watch the early morning sunlight play over Longs Peak. Memories upon memories: I sat thinking about two attempts to summit Longs Peak years ago. Hiking alone, starting before dawn, making it to The Keyhole each time, then being turned back by black ice or thunder clouds. 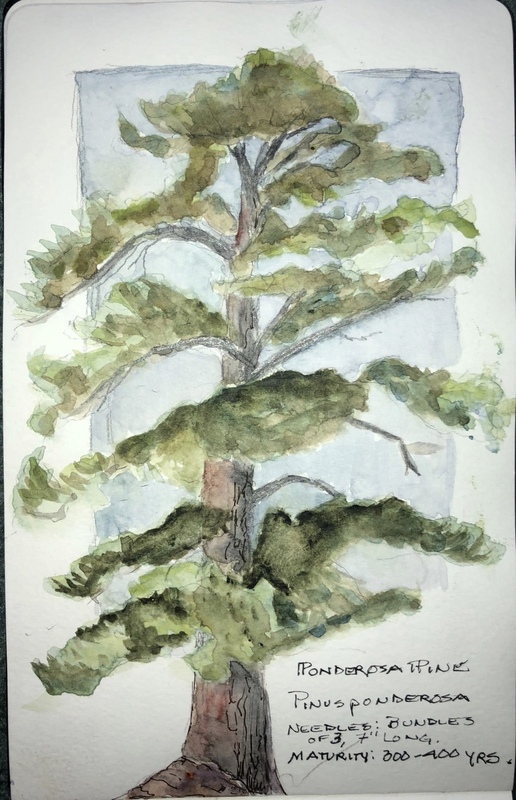 This trip’s memories play as I look at the ponderosa pine I drew, remembering the difficulty breathing at high altitude while climbing steep rocky trails to The Lock and Lake Haiyaha. Stellar’s Jays often flit between trees especially near a waterfall or lake. I rarely see them here in Yellowstone, but in RMNP they were a daily sight. I remember Fred calling me back to see three moose cross the trail behind us, and I remember another hike: a bugling bull elk herded his harem across the trail and up the hill in front of us. I remember the surprise and pleasure of discovering a new favorite place. This small gem of a monument provided one of the best campsites ever with views over Grand Valley. Our original plan to stay just a few days turned into a full week as we hiked new trails in Monument and Wedding Canyons. 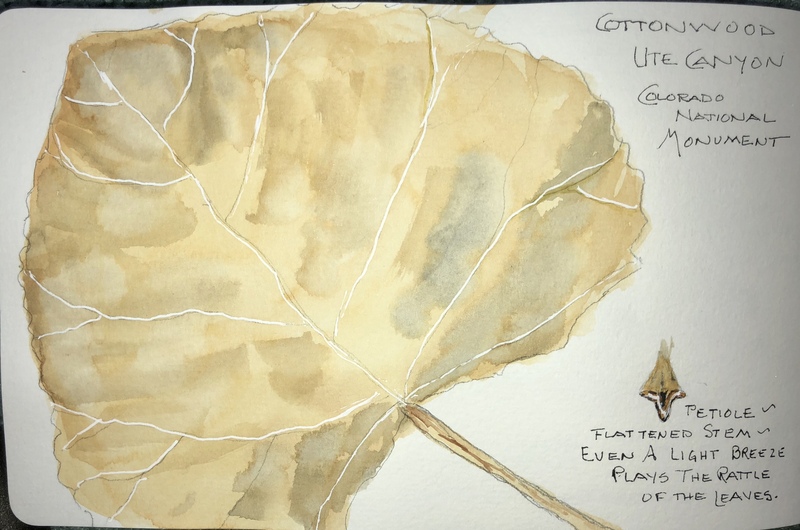 I remember warm sunny afternoons, and descending into the canyons, into the land of red rock walls and spires, walking along trails carpeted with yellow-gold cottonwood leaves. They felt leathery and supple as I picked them up. 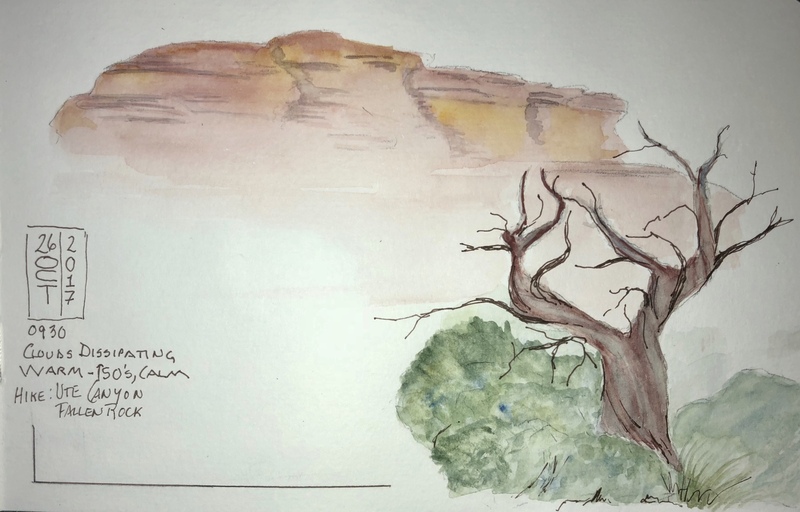 I remember warm mornings and afternoons, clear skies, walls of red rocks, hiking old favorite trails: The Joint, Confluence Overlook, Big Spring and Elephant Canyons. I remember climbing up and over smooth slick rock, ears opening to surrounding silence. I remember waking up the day after Halloween to find a mouse caught and dispatched by Chico our cat. I still wish I knew how mice get into our trailer. I remember most the feeling of being ‘home’, my eyes caressing familiar beloved views. Our national monuments, forests, wilderness areas, recreation areas and parks weave the warp and weft of my memories. Our world changes but these lands are a constant in my life. I pray that they will remain long after I have gone on. Loved this piece Julianne. As I look through these sketches I fondly remembered photographing you as you sketched while waiting for the eclipse. You are becoming quite the artist. I am deeply saddened by what this administration is doing to our public lands. Where will it end? Thanks for your kind words, LuAnn. I am finding that there is not enough time in the day to do everything that I want to do–journal, yoga, ski, write… and more. 🙂 I, too, am disheartened by the attack on public lands (among so many other attacks) but am hopeful that the outdoor industry will realize its financial clout and begin to fight the good fight. We have more strength than we realize. I work to keep hope alive, and hope that my words will resonate enough to galvanize others to make calls and support our public lands. Your posts keep me motivated to fight the good fight. Aaaaaaah…your writing, your “sketches,” your photographs, even the quotes soothed me. Yes, there is the concern for our public lands, but the overriding feeling in this for me was sharing those places with you, since I’ve been in similar ones myself. I thought of the time Skip and I camped at Whistler Campground near Jasper, Alberta. I think we took a bit of a walk to see the stars after an evening program. It was so dark and then there were the sounds and odors of animals…it felt as though we were surrounded by elk. We were lucky not to have been stepped on or worse as it was September or October. Next, I remembered a favorite Ponderosa at Great Sand Dunes, the one where I first remember seeing the jigsaw puzzle pieces that make up its aging bark. So many memories and hoping there will be many more for us all. Thanks, Julianne.